for breakfast to our vegetarian guests, I slice up some pre-made polenta and pan fry it with a smidgen of butter (if permitted....) to a light brown crust, douse it with some maple syrup, badda bing badda boom - tasty morsel on the plate. I prefer to buy the 'pre-made' polenta - i.e. made, cooked, shrink wrapped, just slice and (whatever.) I've tried making my own from scratch - it's tricky to get the right consistency. grits I've mastered, polenta I guess I could 'master' with sufficient experimenting. so - bottom line is, although polenta is fine 'on its own' it is rather bland; including for example the only thing I could get my hands on last week - which was ueber-priced organic with sun-dried tomatoes,,,,, etc etc. any suggestions / ideas / dishes for pre-prepared polenta and (....) to make a tasty meatless dinner? this is a 'main meal' kind of thing . . . .
Parmesan polenta rounds are my favorite little dippers for Italian Pot Roast. I just slice them thinly, fry in a mixture of butter and olive oil, and then top with some grated parmesan. aaahhhhhhhh, shrooms I can do! thanks! Evening, gentlemen - Polenta I know very little about and am not altogether sure I can find pre-made around here. It sounds a lot like the Scrapple we get periodically that we both just love - but that's not meatless - kind of a sausage thing done up with corn meal. Luvs would know about it if nobody's ever tried it. With maple syrup, it's truly delicious! But it hails, originally, from Luvs' neck of the woods. Good stuff! Sorry to hear about your automotive woes, Cooksie - sounds like that car is nicholing and dimeing you to death! Preheat oven to 450 degrees. Coat eggplant slices with cooking spray on both sides. Place on a baking sheet and bake 20 minutes or until tender. Reduce oven to 375 degrees. Place 4 slices eggplant in bottom of a 9-by-13-inch baking dish. Spread with 1 cup marinara sauce. Sprinkle with 2/3 cup mozzarella and 1 tablespoon Parmesan. Repeat once. Top with polenta slices, remaining sauce and both cheeses. Bake, uncovered, 20 minutes or until bubbly and cheese melts. Per serving: 245 calories (percent of calories from fat, 29), 14 grams protein, 29 grams carbohydrates, 6 grams fiber, 8 grams fat, 25 milligrams cholesterol, 758 milligrams sodium. that looks dang good - picked up an eggplant today - on the menu for the weekend! I may sub some fresh garden tomato sauce - I'm swamped at the moment with the red thingies . . . .
One more idea...Texas Caviar, Cowboy Caviar, whatever you call it. There are several different recipes on here. ETA: Thanks, Ian. Any more problems and I'll be eating tree bark for a while . I'd love to hear a your thoughts on the recipe. Cooksie - "Texas Caviar, Cowboy Caviar," seems to be basically a salsa, no? i luv ketchup/syrup on fried polenta, & sharp cheeses blended in.- i know sugary syrups can be common, too. ummmm. Yes, a black eyed pea salsa. It's supposed to look like caviar . Basics are black eyed peas and a vinaigrette dressing like Zesty Italian. Let it marinate in the vinaigrette and fold in some chopped avocado when ready to eat. the menu planning changed a bit so it was Tuesday for the Baked Eggplant and Polenta. overall, very good dish - flavors go well together. and, if using am "already" prepared sauce (home made or out of a jar...) very quick&easy to fix. the one glitch I encountered was the eggplant slice pre-bake time. 20 minutes at 450'F made them too soft for my liking - took some careful long spatula work to assemble the dish for the final bake. also to note: allow the final dish to cool 10-15 minutes so the (melted) cheese can set up a bit. makes for cutting out portions & service easier. I prefer eggplant to have some 'structure' remaining; so I'll be adjusting the timing of the pre-bake / bake. how mushy one likes one eggplant is apt to be a personal preference - adjust accordingly. bottom line - very good option for a vegetarian dish and I've got it on my 'to do again' list. 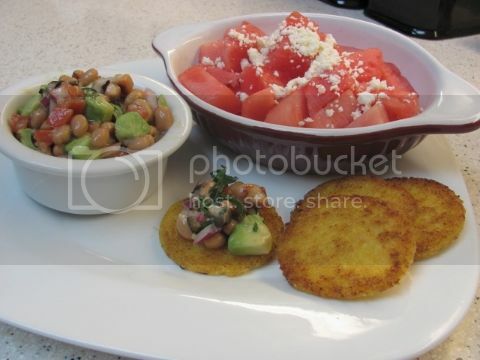 the black eyed pea salsa is also on my list. we're fond of BEPs, lentils, etc! I'm having the polenta rounds with the BEP salsa tonight. Did you ever try it Chowder? not done the salsa thing - but the mushroom ragout is a winner! Oh yeah...I love that mushroom sauce. The salsa got put off, no black olives, but I'll be doing it real soon. I see eggplant on the menu for next week. need to stir the pot on the salsa idea. I wish Cooksie was around so I could ask her how she got her polenta so browned. I tried frying up some sliced pre-made polenta for the first time tonight. Very little flavor but a good vessel for my picatta sauce. I've found you have to greatly over season things like polenta or grits to get flavor. That looks really good, love lemon and capers! I use a combo of butter and olive oil to brown the polenta. Yours looks brown to me . Okay, I used just butter and simmered on low - took forever! So next time I'll add some oil. the butter methinks really helps with the browning. also - I lightly dredge the slices in AP flour - wheat flour browns more easily than corn flour.